Very.co.uk and Littlewoods owner Shop Direct says it will change its corporate name to The Very Group to bring its name and identity in line with its flagship consumer brand. Retailer Bensons for Beds is moving to new Accrington headquarters in order to accommodate a number of new hires, according to regional newspaper The Lancashire Telegraph. Flacks Group, the investment firm that last month said it was considering bidding for Laura Ashley, now says it will not press ahead with a takeover attempt. The supervisory board of Koelnmesse has decided to "terminate the working relationship" with chief operating officer Katharina Hamma with immediate effect. Half-year profits jumped for Wincanton with the logistics business citing the growing impact of ecommerce and the success of its business in the home and DIY retail segments. Howden Joinery Group, which sells kitchens to consumers via small builders and installers, likely gained market share in summer/autumn trading as sales climbed. Visitors can now signal their interest in attending the BFM-organised London Fabric trade event next spring following the launch of the pre-registration process online. 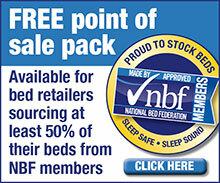 Rest Assured, the Silentnight-owned bed maker, has expanded its retail footprint with brand showrooms inside new partner stores. The John Lewis Partnership, parent to department store retailer John Lewis & Partner and supermarket chain Waitrose & Partners, says chairman Sir Charlie Mayfield will step down during 2020. Like-for-like sales inched 0.1 percent ahead in October according to the BRC-KPMG Retail Sales Monitor, a closely-watched retail survey.